Ocean View really doesn’t necessarily mean you look right out at the ocean… you may have to lean over the balcony and turn your head a bit… we requested a different room. The second room was great it even had a window or two that look over the ocean a true “ocean view” so beware you may want to request or ask about the view. The room was very nice. My husband and I took a nice 5 night trip here 2 years ago. We stayed in an ocean view room in the main building. We were one floor up from the bar/restaurant. We did not hear any noise. The room was nice. Except, we did feel that it was very humid in the room. They actually have a humidifier in the room, which was nice. The resort is very nice, however, there is literally nothing to do in the surrounding area. At night, at the campfire, for the Smores, we had to leave, because the insect were just biting too much. We would do it again, but this time for only 3 nights. This way, we would not get too bored. Our vacations are usually on the go, and too much time to lay around is not our thing, and I am so fair, that I can only do the beach for an hour or 2 at most. Oh, we did not rent beach umbrellas or chairs. We drove to Walmart and bought our own (still cheaper than one day rental), and then upon checkout, we found a family and gave them to them, and just asked that they passed them on as we did. Margaret DVC 1997 - OKW - 10 Years! WOO HOO!! Time Flies When You're Having Fun! We stayed in an Ocean View "Deluxe Inn" Room. The room they gave us actually overlooked the pool and you could see the ocean in the distance (not Ocean View in my opinion). We asked for a different room and got a nice room overlooking the beach. There were so many activities for the kids, they had a blast! The water slide was great for them - even our little one who wore one of the free lifejackets they have. The sit down restaurant is just O.K. and if you want to go out, it's quite a drive. That was hard at night as pizza every night was not in our plans. We reserved 2 OVIRs and requested that they be connecting. I was a little worried about this since I knew it was only a request and we had young children. We were pleasantly surprised at check-in. Not only did we get our connecting rooms (whew!) but they were at the center of the Inn on the 4th floor. If you look at the rounded balcony above the green cabin room that was it. LOVED the ocean view. The only negative was that the beds were too hard and the carpet was a bit worn (but it is the beach afterall). The pool area was great especially with the kids. Lots of organized activities along with mini-golf, shuffleboard, ping-pong, game room. The pool bar was right there as well with some good food options, adult drinks and a self serve drink machine (for those refillable mugs). I think the weekends had a DJ around the pool for music and games. Having everything contained in a gated area was nice with kids. We had a great time. Be warned however there is not much close to the resort. If you come to VB, come to be at the beach. we see the entrance to the resort where you will park your car momentarily, check in, get your parking sheet.. Trying to find the right size pics for the post! Next you will walk into the resort, passing thru the front porch. Have to upload more pics.....more pics and report to come! Here is the bowl of shells that you should sign with your family name and date...ours is in the bottom right..
Next we'll travel down to the beach where there are hardly any people!!! I just can't get over how there were not that many people on the beach, and the resort was at full capacity. It was hot this week, but not too hot or the water!! It was wonderful, no jellyfish, clear. I'll take you down the walk ramp from the resort onto the beach with several beach pics! Here are the water mice you can rent just floating in the water waiting for you! Here's the hubby payin the bills....yes even on vacation! Here's a turtle nest...they have a bunch of these up and down the beach.. Here's a beach cottage!! I'm gonna rent this even though it will only be the hubby and me...gotta try it! Pros: It was beautiful! Very relaxing for a couple of days. Cons: Not a lot of nightlife. They are very strict on the pool hrs. Make sure you ask for a open balcony. The walled balcony obstructs the view (especially if you have children, they will need to stand on a chair to see the water. Not exactly safe.) If you cannot have the open railed balcony it is not worth the extra points for the ocean view. Be sure to ask for directions to get to the little town about 10 minutes south and have a cocktail at Mulligan's. Its a great place right on the beach. We stayed in unit 2217 and it was great. Second floor is nice because you don't have to use the elevator very much. The room was very nice and the view was great. There were only 13 rooms booked that night so I'm wondering why January isn't low season. The water in the swimming pool was a little cool. We were there from Jan. 14-18th. Cons: Beach is a bit rough. Isolated location. Vero is an upscale town with not alot to do but shopping in boutiques. This resort is in a quiet area of Vero where you have to drive about 10 minutes to shop and dine out unless you eat at the resort. Next time I'd get a kitchen to cook some meals since eating in the same restaurant gets old after a few days. Nice pool area. The posted pictures capture everything. 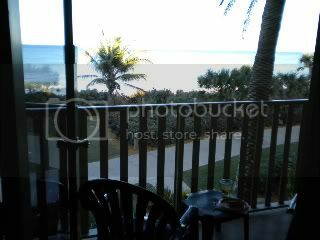 I had an ocean view room and it was a little obstructed but you are practically on the shoreline and the lull of the waves was very relaxing to sit on the balcony and enjoy the views. The pool has a nice snackbar and they do movies by the pool at night. I didn't care much for the beach. It was pretty rough for my taste. I prefer Fort Myers or Hollywood beach. But the resort is worth visiting even if you don't use the beach. The rooms are nice and do get humid if you leave the door open from the balcony but this is normal for Florida. So go and enjoy this nice resort. Hopefully Disney will open more beachfront resorts in Florida. Nice concept and tastefully carried out. Enjoy it. We were at Vero Beach for the first time and loved it. The kids enjoyed the beach and even went on a turtle excursion where they helped the researchers count and document the hatchings. Room was beautiful and very clean. Staff was very friendly. Husband treated himself to a massage (on my credit card!) and daughter got her hair braided. We had a wonderful two days. If we had stayed a week I would be worried that we may hav gotten boared since there is not alot around Vero Beach. The only thing that really stunk was the No See ums. Bring Bug Spray! DW and I were travling with another couple and booked two Deluxe Inn Room Ocean View accomdations and were assigned rooms 2020 and 2021. The rooms were not connected which was fine. Both rooms had a walk out balcony and a spactular view of the ocean. We were only staying for the weekend due to the turmoil anticipated from the sand replinishment project. Overall, we found that the beach project was not a factor. The beach was closed on Saturday as truck hauled sand back and forth, but work ceased completely on Sunday and the beach was open to the public. Everything was great in the room and in working order. The resort was very nice. We found the cast members to be especially friendly, reminiscent of the early days in Disney World when everyone was a special guest. Dining was limited, but we did enjoy two meals off site at a restaurant called "Squid Lips" and another called "Capt Hirams" both were nice casual dining experiences and affordable. We found out that Vero Beach enforces the 11am check out, but does encourage guests to stay after check out and enjoy the amenities of the resort for the entire day. The view from the room was spectacular, we stayed on a weekend with clear skies and a full moon. So the views in the evening were great, and the sun rise in the morning was the most beautiful that I have ever experienced.